Description: Were miracles only for people in Bible times? 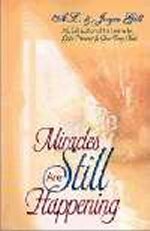 Has God stopped doing the miraculous? Joyce and A.L. Gill thought so...until one day when they faced a life-threatening situation and God intervened, preserving them from death and changing the course of their lives. Since that day, the Gills have researched what the Bible has to say about the miraculous and have experienced many more miracles, such as supernatural healing, divine direction, and the prevention of natural disasters. In this fascinating book, you will discover how God's miracles are available every day, giving us guidance, power, protection, and provision. You will also find specific steps to receiving miracles and to experience God's supernatural intervention in desperate situations.